Jean-Yves Lorant, author of the two volume history of JG 300, was recently in touch with the sad news that one of the last living JG 300 Sturm pilots, Hans-Dieter Oehm of II. (Sturm)/JG 300 - one-time wingman to 'ace' Konrad Bauer- has passed away (this was shortly after Christmas 2016). 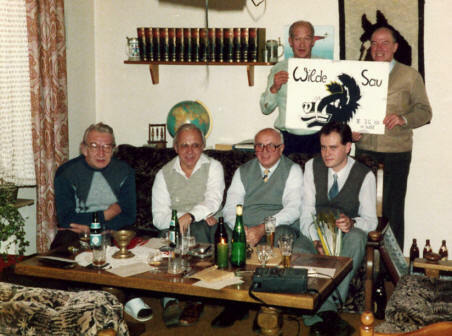 Hans-Dieter was 94 years old and had corresponded with the wilde Sau Geschwader historian since 1982. Qu: Bonjour Jean-Yves, could please tell us a little about yourself as writer and historian? J-YL "..I wrote my first article as a freelance for the French aviation magazine 'Le Fana de l'Aviation' in 1975 - the same year I earned my private pilots license - and passed my school leaving certificate. I did my military service in 1976 in the French Air Force - assigned to BA 901 - at Drachenbronn in Alsace - where I worked on the base newspaper. I subsequently spent four years on the staff of 'Le Fana' working on all aspects of the magazine, subbing, editing, re-writing etc. 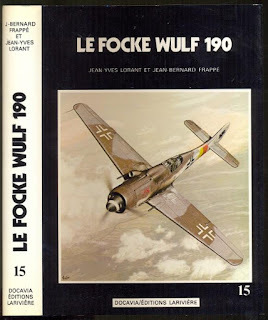 During this period I was researching and writing the Docavia Focke Wulf 190 with J-B Frappé - I was still in my teens and while the book is a decent enough history reference - at the time only my friend Alfred Price's 'Fw 190 at War' could be considered so - I didn't know then half of what I do now!.." 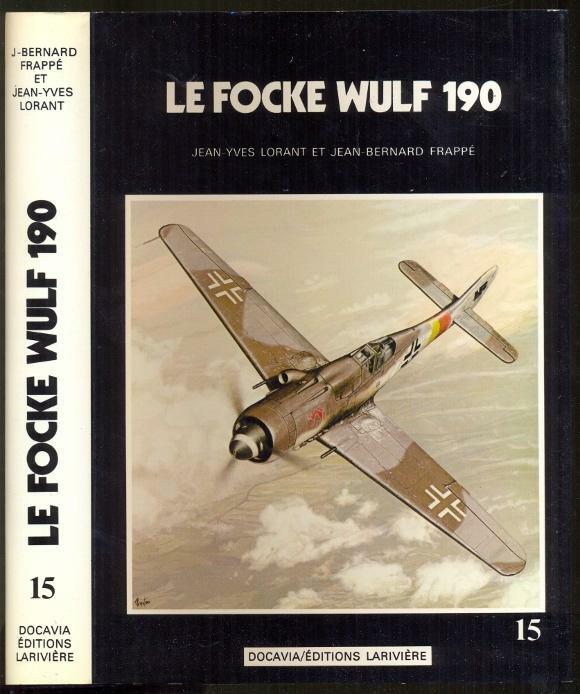 Below; 'Le Focke Wulf 190' (Larivière, 1981). The jacket cover 'composition' was painted by Richard Goyat and depicts Hagen Förster's 7. Staffel JG 301 Dora 'white 8', photo on page 362 of the Lorant book. While featured on the cover, the Kennung was 'purposely' difficult to decipher while the photo reproduction was particularly poor. Even today most 'Experten' are left wondering what the Staffel number was, while artworks and models usually just feature an empty space where the 'white 8' should appear!
" ....The intention was to improve on Nowarra's Harleyford Fw 190 book. Heinz Nowarra I knew well - I translated his articles for 'Le Fana' - he was always a very disorganised guy though - under pressure from his publisher- and his last works were pretty chaotic affairs. When he used to come to Paris in the late seventies I would always have to book his tickets at L'Opéra. When he wasn't working on his books he could be found listening to classical music or pruning his roses. In 1980 I joined the staff at the Musée de l'Air - and spent sixteen years rummaging around in dusty archives, researching and writing photograph captions. I left when the museum started to employ graduates with deep interests in Byzantine Art but none in aircraft! It was also in 1980 that I first met a young lawyer by the name of Jochen Prien - we've been good friends now for 36 years. Time flies doesn't it? I subsequently joined the S.H.A.A (French Air Force historical branch) - now the SHD, the Service Historique de la Defense. That was twenty years ago and I'm currently responsible for the photo library - a collection of some six million photographs - none of which I have been able to use in my books !.." Qu: How did your interest in JG 300 develop? What was your aim in writing the two volume history of this unit? J-YL .." Like all air enthusiasts of my generation my bedside reading comprised the 'classic' fighter pilot memoirs; Dupérier, Clostermann, Knoke's 'Die grosse Jagd' etc etc. During the early seventies Werner Girbig published his 'Start am Morgengrauen' (translated in English as 'Six months to oblivion') which portrayed the defeat of the Luftwaffe fighter force with particular emphasis on the Bodenplatte operation. It was a book that virtually amounted to one terrible list of losses. It gave the impression that every sortie was a massacre and that during 1945 lack of fuel and aircraft meant that the Luftwaffe had virtually ceased to exist. As it is, most historians tended to skirt over the last months of the war in their unit histories, mentioned JG 300 in passing - but there was never any detail. I was left with the impression that the real history of the last months of the war - seen from the German side - had still to be written. Of course JG 300 was heavily involved in these last air battles of the final months of the war so my attention was naturally drawn to this unit. Its losses were indeed terrible - a rough calculation shows that that the average life expectancy of a JG 300 pilot for the last year of the war amounted to just 11 hours of flying - barely four sorties..including check and ferry flights.."
Qu: How much time was devoted to the research and writing of the books? How was the work-load shared with your co-author Richard Goyat? 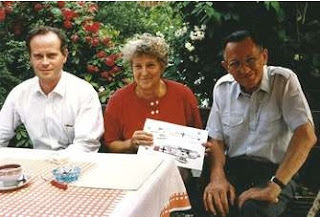 J-YL .." I met my first veterans - from the Sturmgruppe II./JG 300 - in 1977 and started reseaching their stories in 1978 with the aim of filling in some of the gaps that existed in the history of the air war 1943-1945. In total there is about 25-years worth of research in the books while the actual writing took about four years - on and off - family commitments and a spell of illness got in the way a little bit- having the builders in at home didn't help either.…I met Richard Goyat in 1979 and he soon took on board the job of researching in the Anglo-american archives. Richard's 'speciality' - aside from his superb paintings of course - was combing the FG mission reports, compiling and drawing up maps of the tracks flown -hour by hour - by the different US and British formations. These situation maps enabled us to compare and contrast events night by night and day by day with the German veteran accounts and log books. In the end we had an annotated map for every day of air combat, details that were enhanced and completed by comparison with the Lagekarten (air situation maps) drawn up by the German air defence authorities at the time. The main research effort was devoted to tracking down former members of JG 300 - by running a fine tooth comb through the loss lists of the various authorities, Red Cross, Bundesarchiv, WaST etc I was able to use the details therein to hunt down the relatives & families of the injured, or even the former servicemen themselves. As a general rule the Germans are quite sedentary - there is a good chance for example that a mechanic stationed at Holzkirchen during 1944 might still have family in the area. From there it was a straightforward if somewhat arduous task - involving many trips to Germany - to dissect telephone directories, marriage registers etc etc in the hope of locating a family member. Here's just one example by way of illustration; I learnt from Heinz Wischhöfer (1./JG 300) that his Staffel comrade Hans Fenten had been living in Düsseldorf during the sixties. The phone book for that city listed no less than 28 people with the name of Fenten - I must have spent hours contacting them all before finally getting through to Hans Fenten himself - needless to say he was amazed to learn that a young Frenchman speaking German had been trying to track him down. While terribly time-consuming it was ultimately a very rewarding experience - although there were plenty of ups and downs; moments of both joy and depression! Not forgetting of course that all this was undertaken without the aid of the Internet !.." Qu: How were you received by the veterans themselves? J-YL .." Richard and I always received a warm and friendly welcome where ever we went. 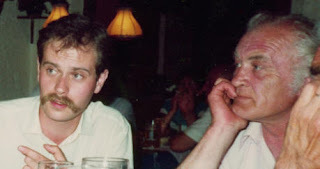 I felt it was important that we actually travelled to meet every one of our contacts - many of these gentlemen were far too frail and elderly to write down their stories and they were always more forthcoming over a beer or meal - with the tape recorder running discreetly alongside. Even so, it was no easy task to get some of them to open up about what had been on occasion deeply harrowing events - more than one veteran was reduced to tears as he recalled events that he had no doubt spent many years trying to forget - on one occasion the wife of one pilot warned me that her husband had already suffered one heart attack and that she didn't want me inflicting another perhaps fatal one. Being a pilot myself also helped when it came to discussing aircraft performance, the problems of navigation and weather - in general the veterans were generally less inhibited than might otherwise have been the case. But they were no less restrained when it came to evoking a sentiment that was ever present both before and during sorties - sheer unadulterated fear. 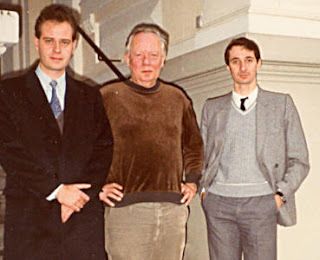 Most were also open and frank on other 'difficult' subjects - the various substances and stimulants that were taken to combat these feelings of fear, the performance - or otherwise - of their leaders and on the Nazi regime in general......"
"..... Gerd Stamp (pictured, left, with J-Y Lorant and Richard Goyat - Nassau 1983) once said to me, " Jean-Yves, between Bismarck and Hitler we Germans have been very unfortunate in our choice of leaders and the sheer sense of shame most of us feel will be with us for centuries to come.." In fact I often got the impression that answering my questions gave many JG 300 veterans the opportunity to get a good many things off their chests once and for all. Incidentally I was told a number of anecdotes that were simply too risqué to include in the book - and at least one - the night-time shenanigans at Bad Wörishofen related in volume 1- was toned down by the narrator himself so as not to overly embarrass the participants - in fact the statue of Pasteur Sebastian Kneipp was adorned with a necklace fabricated from ..condoms. Each filled with the sacrosanct spa water at that! The perpetrator's wife was sitting next to him when that came out. She couldn't believe it ! Generally speaking Germans are not given to invention - where there was doubt about a particular event we chose to leave it out - or waited for confirmation from elsewhere. I recall a discussion with Norbert Graziadei in 1981 - he was an ace with the Sturmgruppe. He promised to get back to me on a particular point. Over a year later - after I'd given up all hope of hearing from him - I received a hand-written letter with detailed answers to all my questions - over 23 pages in length ..! Sadly Norbert died in 1999. My investigations among the veterans had a number of unexpected consequences for some of the former pilots. - I was often able to put them in touch with each other many years after they had lost all contact with each other. The most moving of these reunions involved the four pilots who flew the last combat sortie mounted by III./JG 300 on 30 April 1945 flown from Kleinkarolinenfeld; Klaus Lambio, Arnulf Meyer, Jochen Stiege and Günther Obst. The two pilots that managed to reach Ainring - Stiege and Lambio - had always assumed that their two comrades - reported missing - had failed to survive. None of them had had any contact with other JG 300 vets until I put them in touch with each other - the celebrations that took place the night of their reunion was something to behold ! I organised a number of JG 300 Treffen - or reunions - during my research. Former members of I./JG 300 first gathered at Gerd Stamp's lovely home in Nassau an der Lahn in 1980 while we held a number of II./JG 300 gatherings over the years since 1981. For a while the numbers of participating vets grew larger every year, providing an opportunity for accounts and anecdotes to be compared and discussed. It was in a small hotel at Homberg near Nassau that we first met Hermann Berdelmann who told us how he was shot by Czech partisans in the ground fighting around Prague on 4 May 1945 and how he had been carried to safety by a brave IV./JG 300 pilot who he had never seen before or since. He described him as being of 'North African appearance with an affro-style haircut, olive skin and thick lips' - rather unusual for a Luftwaffe fighter pilot! And the name of his rescuer; " Unteroffizier Eugen Maier …". Richard and I looked at each other dumbfounded - we were due to meet the same Eugen Maier the next day in Winterlingen! As you can imagine Hermann Berdelmann was as surprised as we were and quickly recorded for us a message of thanks which we played the next day to Eugen Maier (14./JG 300). After playing the message to him, Maier was quiet for a moment but eventually muttered ..." hmm, yes, the wounded guy, well at least he wasn't a big fellow. Yes I remember him now. Thank you for that recording.." There were some unforgettable moments during these reunions- Gerd Stamp shooting two wild boar in the Westerwald for one- it took us all three whole days to eat those!.." "...Very occasionally other guests put in an appearance at our gatherings. One of these was a British historian (translator note; Peter Hinchcliffe) who came to Nassau in 1984 during the research for his book. I found him rather ill at ease among the vets - perhaps he saw me as a rival -moreover he appeared only to be interested in the Ritterkreuzträger - Gerd Stamp and Hajo Herrmann - and completely ignored the other former Wilde Sau pilots present . They -needless to say- were rather put out by this. As luck would have it, we never saw him again and ever since I have been wary of allowing others into the circle of contacts that I have built up. This was particularly the case for those veterans from III./ and IV./JG 300. I have built up some tremendous friendships - not just with the vets, but with their families, their wives and children. All this required tact and honesty and a genuine passion and good language skills - a wrong word is often enough to 'block' any contact. You can perhaps imagine how hard it has been to watch them grow old, frail, ill and in many cases, pass away... Needless to say I always took the greatest care when borrowing flight logs and photo albums - these were always carefully returned and it saddens me to see other so-called 'collectors' putting photos up for sale on Ebay - which tend to go for ridiculous amounts -when they have obviously been torn from albums or acquired by dubious means- 'borrowed' from veterans and never returned in some cases...as it is, the number and quality of late-war photos that we were able to collect for the JG 300 books is a source of some pride given the scarcity of such images - compare the quality of similar images in other unit histories to those we present in volume II of our history and you will soon see what I mean ! Such photos were generally only to be found in the albums of those who survived - usually because they had been wounded in combat - or who managed to 'desert' as the end neared.. Right; Ernst Schröder in 1993 seen here visiting Riesdorf . 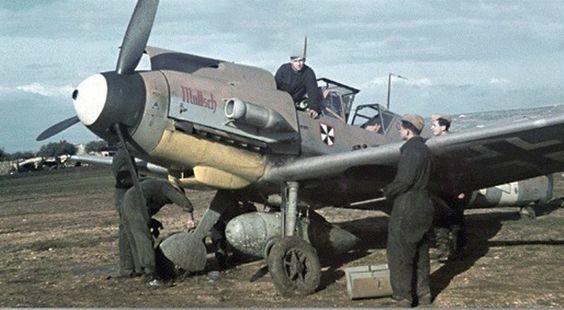 Schröder belly-landed his Fw 190 at Riesdorf on 26 April 1945, voluntarily ending his last sortie of the war. He spent the next two days evading capture..
Qu: What was the the reaction to your two volume history of JG 300 on publication? J-YL " .. The veterans - and I sent out books to those of them who were still with us - were unstinting in their praise and pleasantly surprised and delighted by the scale and scope of the work - and the extent of the primary sources we were able to gather and consult - their praise was of course reward enough for all our efforts. On the enthusiast internet discussion forums the books were very well received; the one or two critical comments -with perhaps one exception - have generally tended to miss the point or been completely off track - Burkhard Otto's (Bobo) comments are a case in point ..and of course he never met the former Staffelkapitän of 8.and 11./JG 300. Something to bear in mind when you read some of the incorrect assumptions on jg300.de (go to this page on this blog for more ). Ehrengardt of Aérojournal was a little critical of the lack of maps - and he is probably right. It should be borne in mind though that more maps would have meant less text and fewer photos - not a choice we were prepared to make. 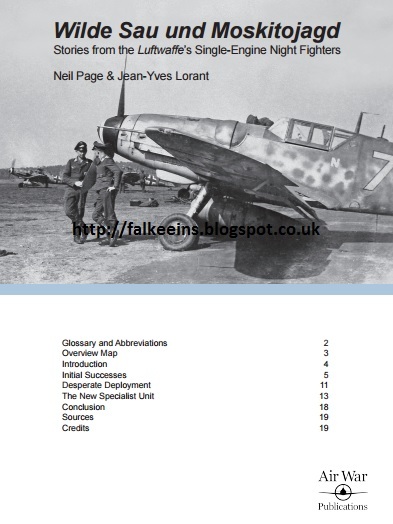 Of course not everyone has read the books - various 'pamphlets' on German nightfighting (published by TMA in France) tend to repeat all the old errors that can be found in Aders and Cuny - the old Aders volume has recently been republished in the UK, but still has the same errors. I should point out here that a work like ours doesn't make its authors any money whatsoever. (French publisher) Larivière sold each of our two volumes for 70 Euros in bookstores - the authors earned just 1.70 Euros for each book sold. In the US, Crandall of Eagle Editions produced an English-language edition but have never confirmed how many copies of our books they sold - although all indications are that Volume 1 sold out, so at least 8-10,000 copies by our estimate. The point is we shouldn't have had to 'estimate' how many sales we made! And at the time of talking to you we are still awaiting outstanding royalty payments from Eagle Editions...many years later!" Qu: Do you have any projects that you are working on currently ? 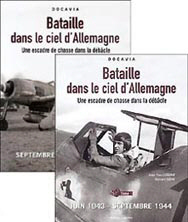 "..the years since we first published our two volume history of JG 300 « Bataille dans le Ciel d’Allemagne » have seen huge changes in the aviation book and magazine publishing business. The Internet has given many people the impression that they can help themselves to everything for free. In my view this has led to a spectacular decline in the amount of magazines and books sold....to take just one example; when I was on the editorial staff of the French title 'Le Fana de l’Aviation' average monthly sales in 1981 were about 32,000 copies. Today the title struggles to sell 9,000 copies on good months. As you may know other titles are in difficulty; 'Air Fan' closed recently, although it has since re-opened. Even an excellent title like 'Avions' prints far fewer copies nowadays than ever before. To survive Aéro-journal seems to have adopted a policy of publishing more and more Luftwaffe articles - usually with any number of errors I have to say - like the recent feature on the 'wilde Sau' or a rather far-fetched 'biography' of Werner Mölders. Of course the Luftwaffe is a fascinating subject - but that unfortunately doesn't mean that only good authors write about it! As for books - even the best, like those compiled by Jochen Prien and Eric Mombeek - only sell in small numbers. Basically, the internet is killing book and magazine publishing. Modern software and digital phone handsets and scanners now all perform so well that it is child's play to take the 'latest' photos and profile artworks and simply put them on your own Facebook page or website. While most who do this are small-time 'thieves', others you would think, should know better. Of course all these 'photo-thieves' are busy sawing through the branch that is holding them up, so to speak. As far as I am concerned I say let them do their own research, contact the veterans for themselves, pay for research trips to Germany and we'll see how far they get! So nowadays I very rarely respond to requests that good friends might make for photos for their works. It is something that I regret, but a necessary step. I am currently working on an updated and improved edition of my JG 300 history, featuring more accounts and new photos- well over 50 'new' and 'exclusive' JG 300 photos. I won't be publishing it through Eagle Editions. Copies will be exclusively for a small circle of friends and colleagues. None of these 'discoveries' will find their way onto the internet where people come up with their usual misinformed captions, where invariably they get the aircraft variant, the pilot name and the dates incorrect which ultimately just leads to more and more confusion. Even 'retired' magazine editors do this - once and for all the Fw 190s of the Geschwaderstab of JG 300 during 1943 had GREEN Kennziffer. 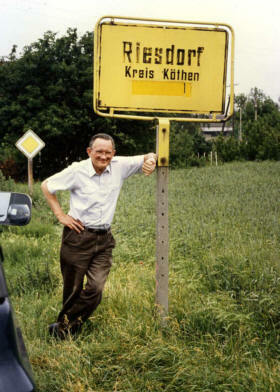 Seen in 1984 Heinz Ackermann, a former mechanic of II. (Sturm)/JG 300 in Rottach-Egern near Tegernsee. 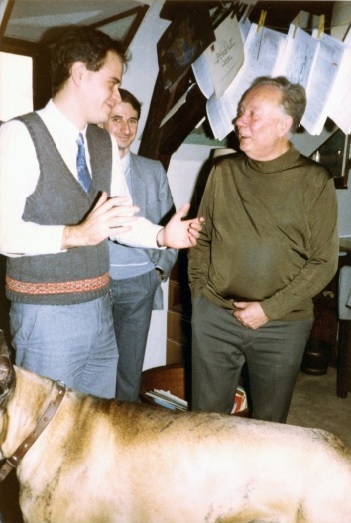 Jean-Yves Lorant on the left. 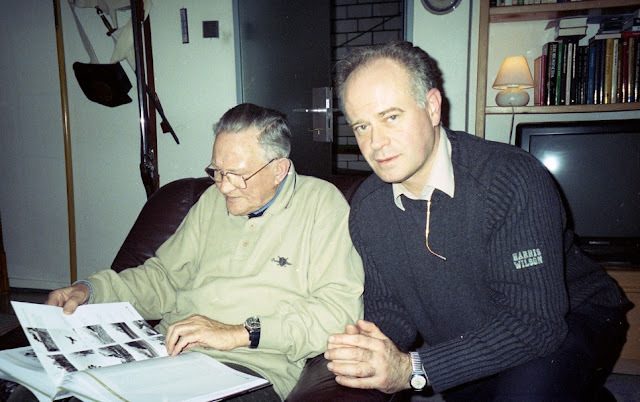 Below; Ernst Schröder and Jean-Yves Lorant together in 2006 at Ernst's home in Bonn-Röttgen browsing through Jean-Yves' two volume history of JG 300. As Jean-Yves says, " ...if I appear a little emotional in this pic, well, it's because I had waited 25 years for this moment! " ..
An eArticle via Air War Publications featuring new personal accounts from wilde Sau pilots of JG 301, JG 302 and NJG 11 with additional material and rare photos from the collection of Jean-Yves Lorant with original profile artwork from Anders Hjortsberg is now available; low-res and 'copyright marked' cover illustration - buy the article -cost, just 4 euros - get all the images and artworks perfectly reproduced!